Detroit rap ringleaders Insane Clown Posse have already built a great deal of hype for their massive Canadian Juggalo Weekend. Before their big Calgary takeover next month, the duo have now given us the full lineup for the fest. The two-day event sees ICP headline both nights. On April 7, they'll be joined by Swollen Members, Onyx, 2 Live Crew, Lyte and Blahzay Rose. On April 8, they'll work with the previously announced Ice-T alongside Big Hoodoo, Kung Fu Vampire, Merkules and Kissing Candice. 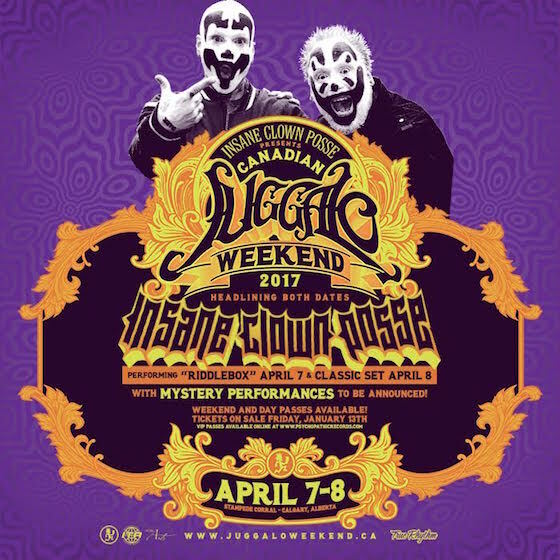 In addition to the music, the Canadian Juggalo Weekend will also include JCW wrestling, games, contests, autograph sessions, face painting booths, vendors and circus performances. The Canadian Juggalo Weekend hits Calgary's Stampede Corral next month. For more information on the Canadian Juggalo Weekend and to buy tickets, go here. Also be sure to read Exclaim! 's interview with the group's Shaggy 2 Dope here.